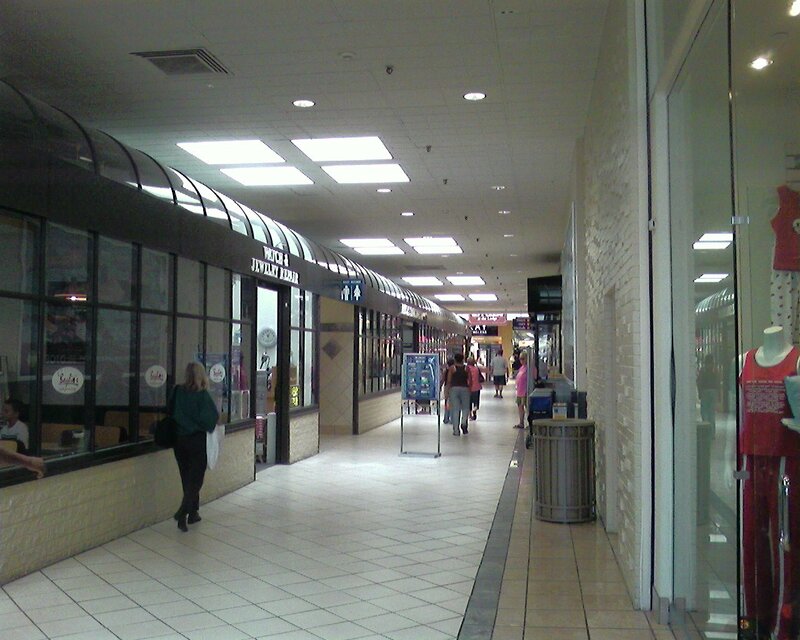 The Westgate Mall in Brockton, Massachusetts is the oldest enclosed shopping mall in Massachusetts, opening in 1963. 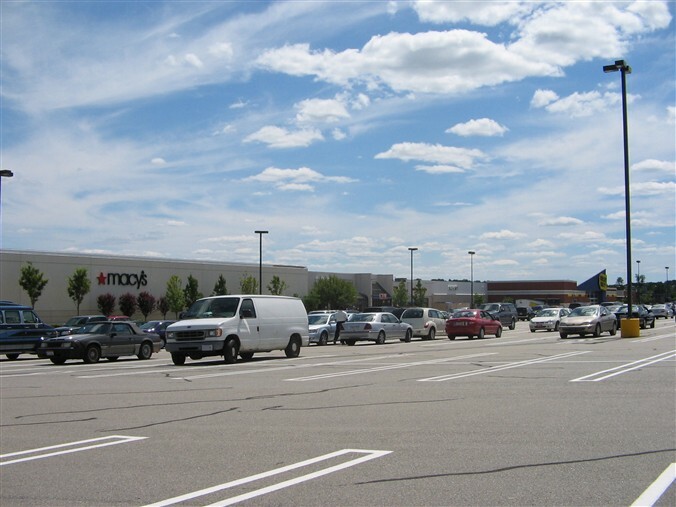 There are several older malls–such as South Shore Plaza, Northshore Mall, and Shoppers World–but they were all built as primarily outdoor shopping malls that were later enclosed (or, in the case of the latter, demolished). 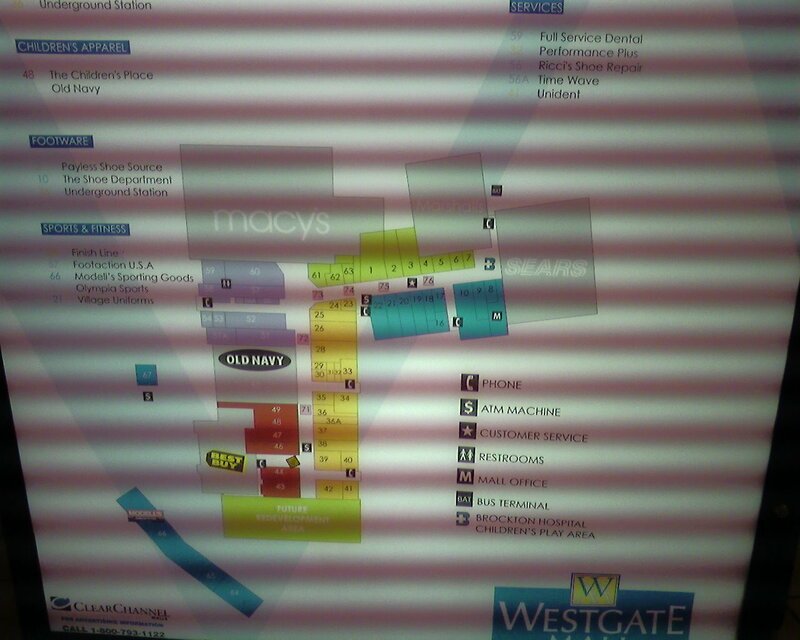 Westgate was the state’s first fully enclosed shopping mall. 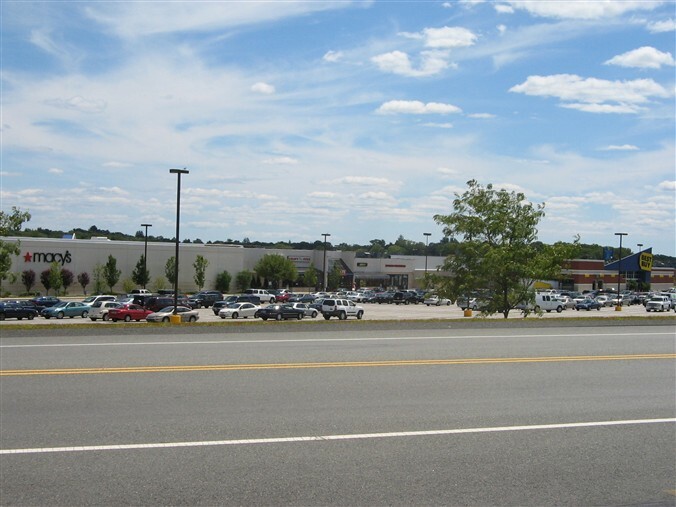 The 600,000 square foot mall, located at the junction of routes 24 and 27 in Brockton, a city of 92,000 about 20 miles south of Boston, is mainly interesting for its historical ups and downs. 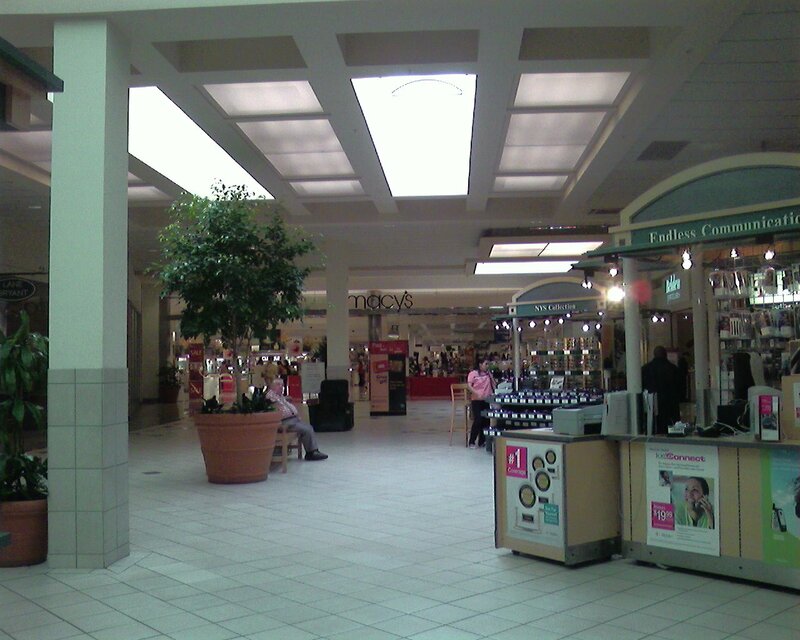 Located halfway between the massive, dominant South Shore Plaza (at present still the largest mall in the Boston area) and the newer, larger Silver City Galleria in Taunton, Westgate has been hemmed in by its large competitors and was near death a few years back. As you can see from these photos, it has survived. For many years, the Westgate Mall was a relatively successful mall serving Boston’s southern suburbs, along the route 24 corridor. It was located in Brockton, one of Massachusetts’ more troubled industrial cities, but its location near the freeway meant it was accessible enough from surrounding suburbs that this was not generally a problem. Westgate was anchored, initially, by Bradlees, Woolworth, and a relatively small Jordan Marsh store. I’m not even positive that this store was built as a Jordan Marsh because its diminutive stature (50,000 square feet or so) is counter to the types of stores Jordan Marsh was building at the time. Later on (I would estimate the early 1980s), a long side wing was added to connect to two new anchors: Marshalls and Child World. 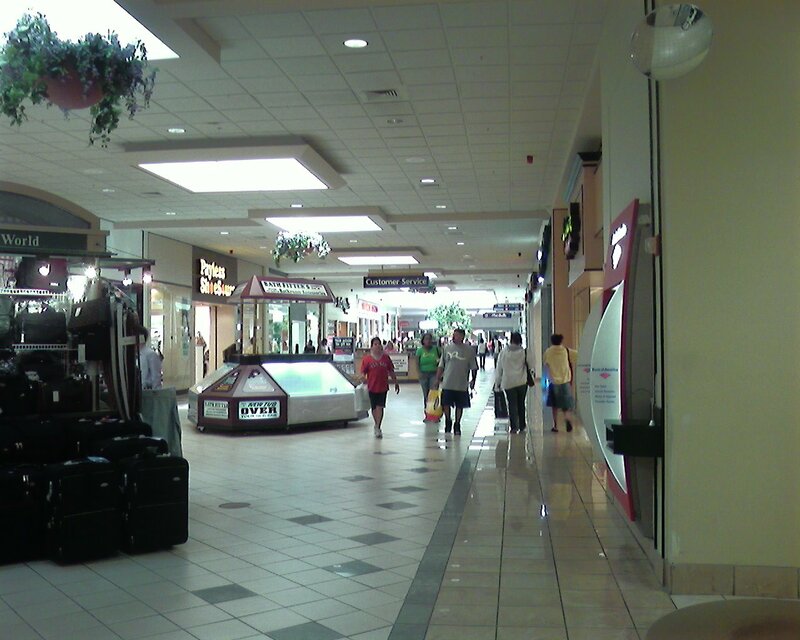 The Westgate Mall was hit hard in the 1990s by a series of major changes. 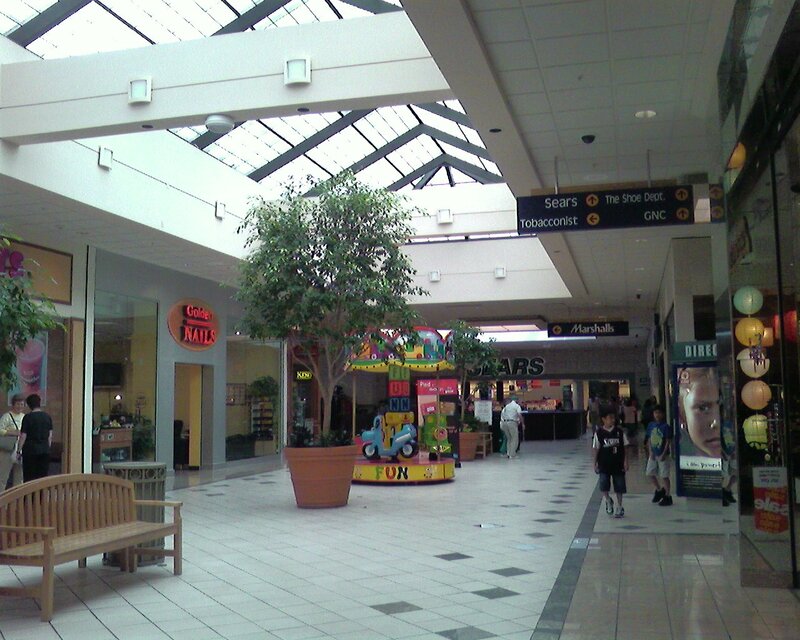 In 1992, the 1.2 million square foot Silver City Galleria opened in Taunton, about ten miles to the south, and in 1996 the South Shore Plaza, about ten miles to the north, doubled in size to become the Boston area’s largest shopping mall. In addition, Westgate’s anchor base took a trio of hits when Child World, Woolworth, and Bradlees all shut (and the mall’s junior anchor, Cherry & Webb, shut as well). 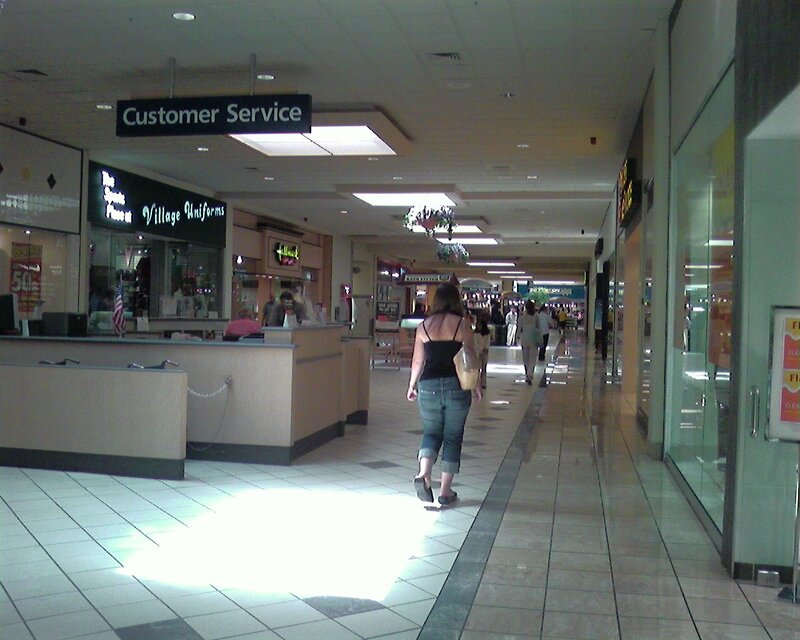 By the late 1990s, the mall was nearly vacant and was in danger of closing. In addition, the Westgate Mall’s sprawling outlots turned into a graveyard of forgotten retail, including HQ, Paperama, Purity, and more. 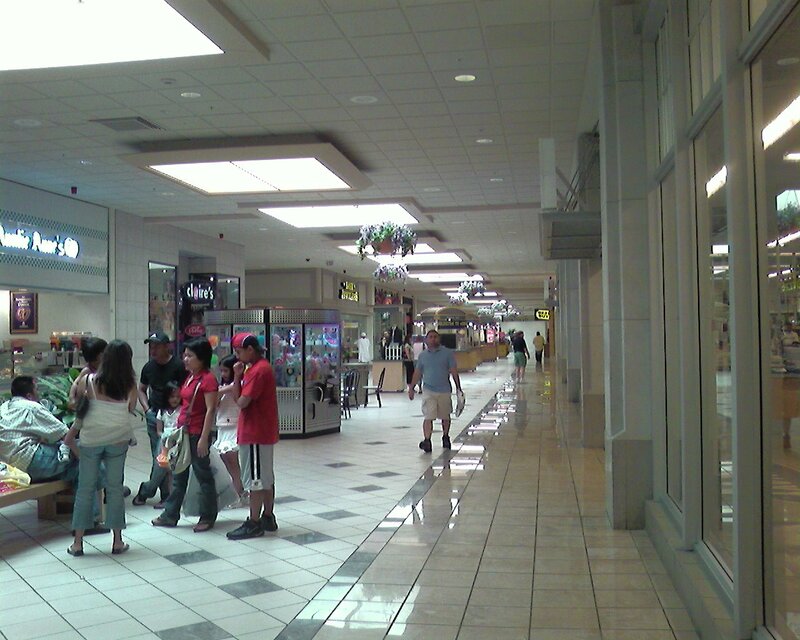 A 2000 renovation and aggressive retenanting by management company Jones Lang Lasalle saved the Westgate Mall. 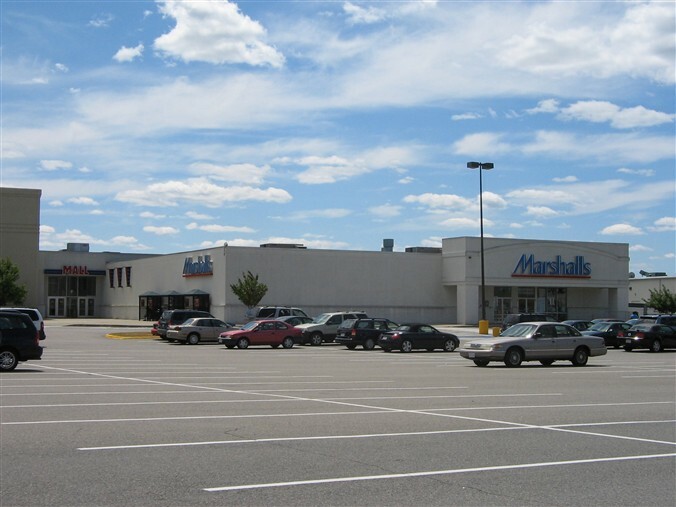 The Child World/Marshalls twin anchor was demolished and the end of the mall reconfigured to house a Sears store, relocated from a standalone space on route 123. The Woolworth was carved into mall space; much of it houses an Old Navy store, but many other standard mall stores fill portions of the space. 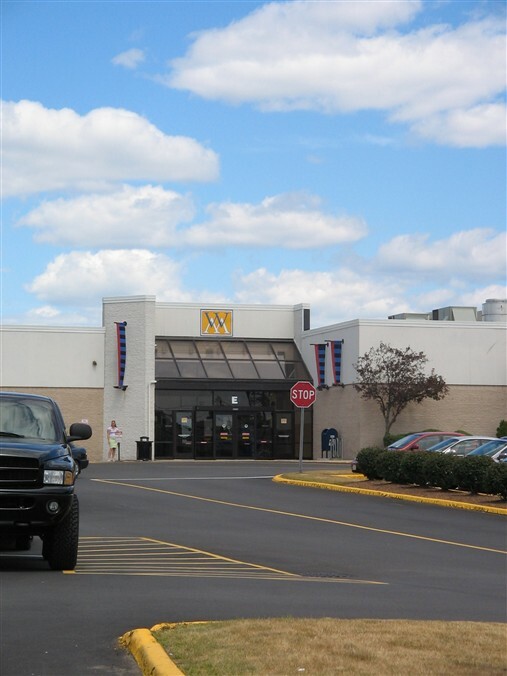 Filenes later demolished the Bradlees space and opened one of their most modern prototype stores in 2002 or 2003, and a long side wing (part of which was home to the old Cherry & Webb and part of which was a Chuck E Cheese) was reconfigured to hold a Best Buy. 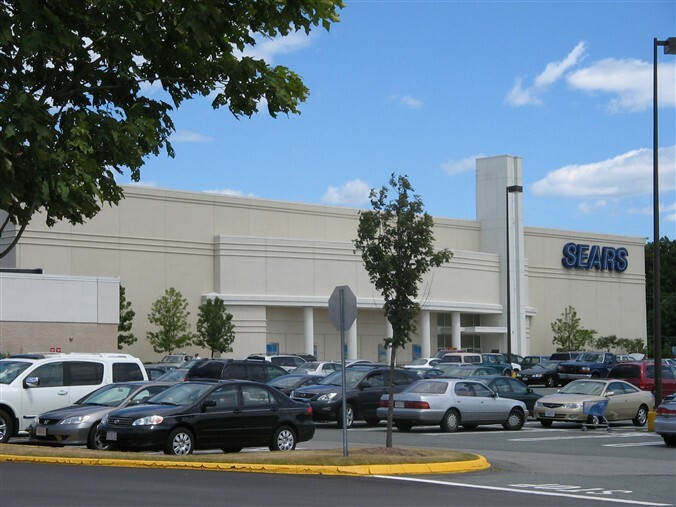 In addition, the Westgate Mall has benefited in the past year or so due to its location only one exit south of one of the only Ikea stores in New England. 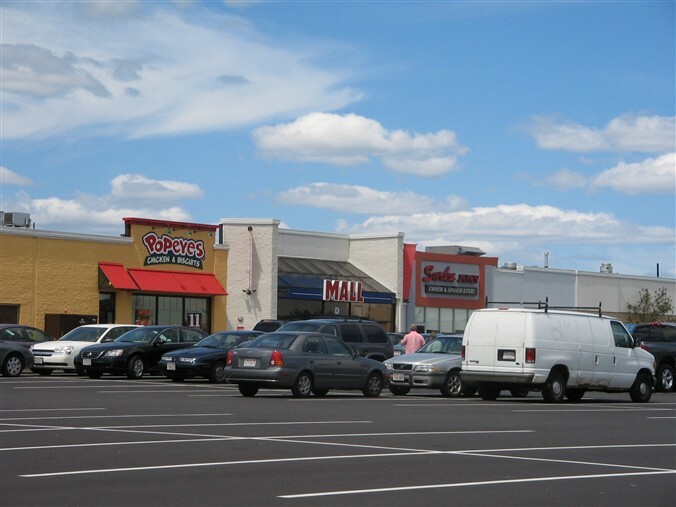 The mall’s proximity to other, larger malls and the stigma associated with its Brockton location still limit its success somewhat (note the vacant Gap store in one of these photos) but it’s a largely successful mid-sized mall that fills in the gaps between bigger malls in a densely populated suburban region. 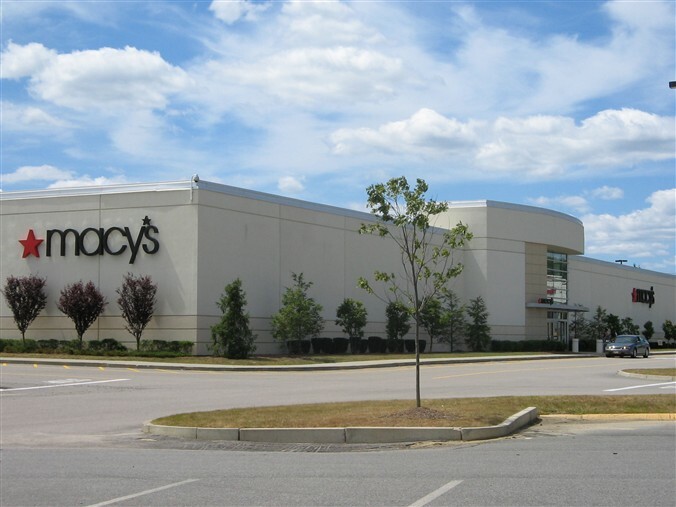 The small, old Macy’s store–once one of the lone signs of life in the entire mall–was shut due to the Federated/May merger, and is now listed as a “future development area” on the mall directories. 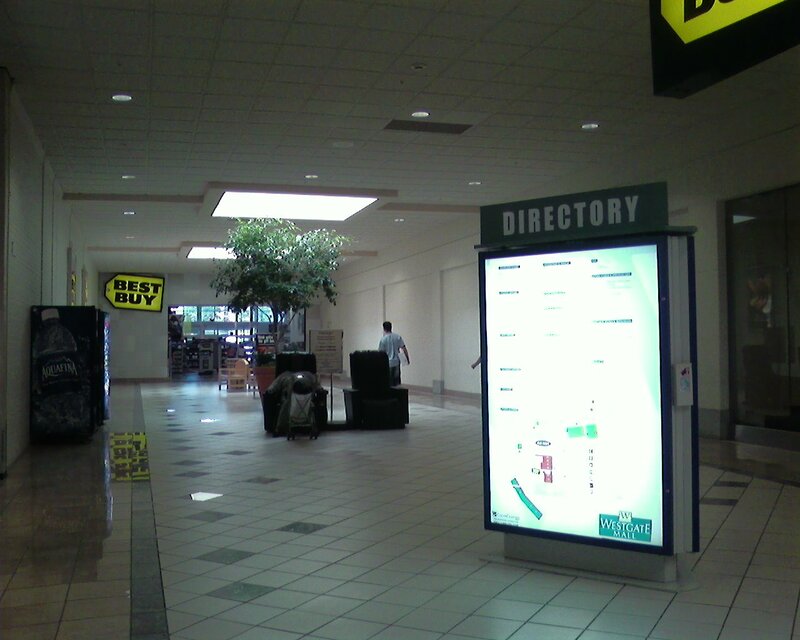 Take a good look at this aged anchor–its one of the last signs of the mall’s advanced age. The former Jordan Marsh is very funky looking. I wonder if it was a Sears or Montgomery Ward in a previous life. While it’s possible, I doubt both. 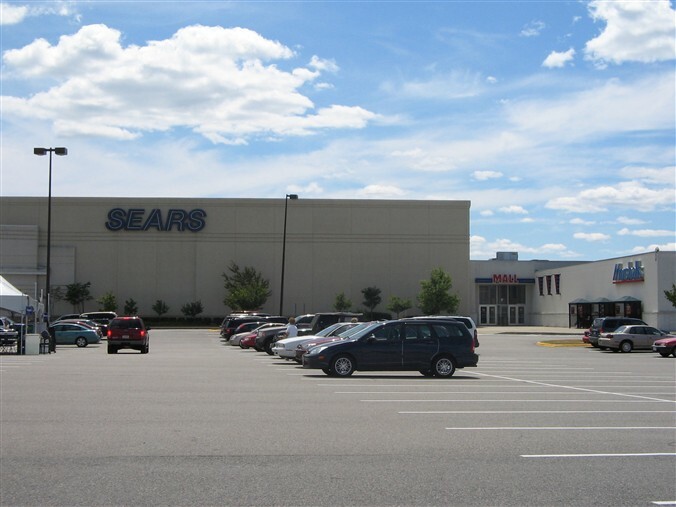 Sears had a very old standalone store on Pleasant St. (Route 123) in Brockton, which only closed in 2000 when they moved to this new store in Westgate. Similarly, I don’t actually know that Montgomery Ward ever had any stores in eastern Massachusetts (or Massachusetts *at all*) though I would love to see a complete list, if anyone knows where I could find one. New England was not one of their big divisions; as far as I know Montgomery Ward only had sporadic locations in Vermont and New Hampshire and noplace else. @Caldor, Route 123 is Belmont Street where the Sears was once located. It was up near Brockton High School. I am pretty sure the Jordan Marsh was built as such originally. That mall was pretty original right up until the mid 80’s. Before building the annex that is now replaced with Sears, Child World used to occupy a smaller space in the front/center of the mall, near one of the entrance hallways. Has a big creepy old sign that seemed to extend above the roofline of the mall on scaffolding. They didn’t do so well once Toys R Us built a store on an outlot. Of course, both are now history in Brockton. I don’t know if Montgomery Ward was ever there, but I heard that they were once in Massachusetts. Older relatives talked about shopping there back in the 40’s and 50’s. I think any stores they had in New England must have been fron the pre-mall era, I never saw a “modern” Wards anywhere up north. I recall Zayre was also once in New England, but not by the late 70’s. Saw a very abandoned Zayre with the 50’s style lettering somewhere in the Boston area in the late 70’s. This was before Ames had bought them out, they were still doing OK down in the mid-atlantic. Zayre did continue to exist, at least in some extent, up until the end here. 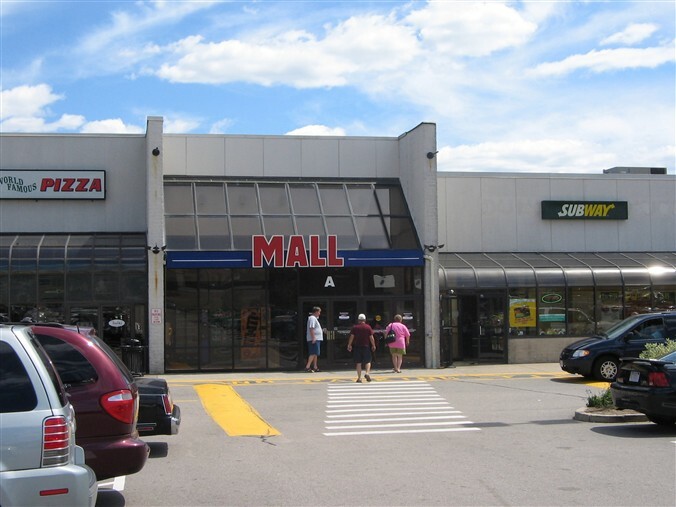 Many of the Ames store shells remaining today (such as Medford, MA) were clearly former Zayres and were acquired and re-branded as Ames. I grew up in Rhode Island (which isn’t exactly the Boston area, but isn’t that far either) and my hometown had a Zayre until 1988, when it became an Ames. I used to shop there all the time. As far as Montgomery Ward, that remains a mystery. The closest location to Boston that I’m positive about was in Nashua, NH. That has to be one of the most ugliest mall entrances I’ve ever seen. I live in the Brockton area. I shop here all the time! The Macy’s space was originally occupied by Gilchrist’s which was a Boston-based department store founded in the 1820s. Gilchrist’s flagship store was located at what is now Downtown Crossing in Boston where it stood across the Washington Street from Filene’s and diagonally opposite Jordans. The Boston store was noted for its macaroons which were baked on the premises (I remember my grandmother talking about them) and they were somewhat of a Boston tradition. Like its competitors, Gilchrist’s began opening suburban stores in the 1950s and 1960s, including Brockton. The downtown store closed in 1975 and the Brockton store undoubtedly at the same time. 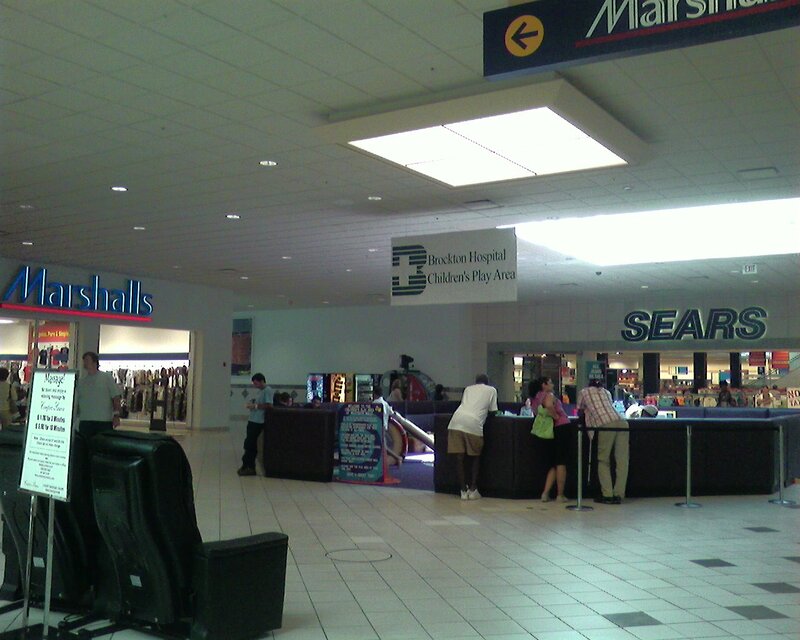 I luckily got to visit this mall right before the transition of the Macy’s store to the former Filene’s. When I visited, the Macy’s was in the smaller space, and the Filene’s was closed, and a sign on the Filene’s said it was to become Macy’s. By the way, is that Macy’s 2 floors, the new one (former Filene’s). I am pretty sure it’s one level. The store has a massive footprint because its space had been a particularly large Bradlees store until that chain folded in early 2001. Caldor, a slight correction on the former Sears. Route 123 is Belmont Street. It was accross from the high school. Many confuse routes 123 and 27 as they criss cross each other when they meet up with Montello Street (route 28). Route 123 becomes Centre Street when t crosses over. I love the Mall the way it is now. Zayre’ was located on North Montello Street. I think I heard that the site was a former roller skating rink. @Paul, Ahh yes, Paul, Zayre’s was located on Main Street. 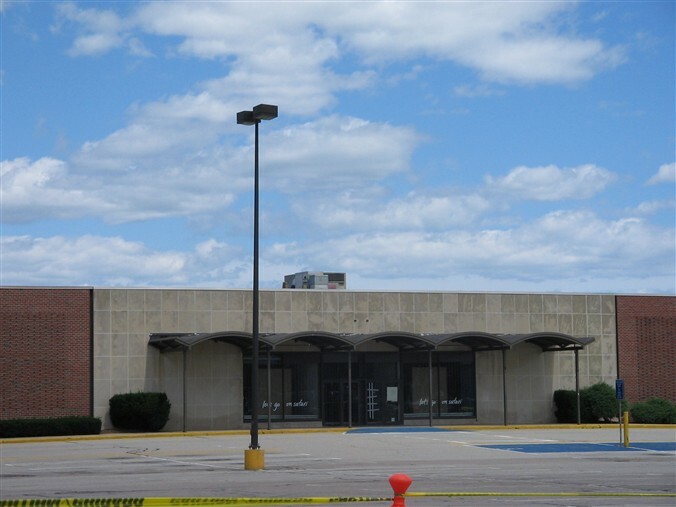 But here’s a trivia question for you … do you remember the name of the store that occupied that the building prior to Zayre’s? @Donna, Before that building became Coats Field, it was the Buick dealership in Brockton. So the one anchor went Gilchrist’s->Jordan Marsh->Macy’s->vacant? The original Zayre was on Main st in Brockton, then they opened one on Torrey st. in 1984, I know cus, I used to work there. The former Jordan Marsh/Macy’s will be torn down for a 12 screen stadium movie theater with additional retail. @DaveLent, The Market Basket is up and running as a free standing store, but shares parking with the Mall. It’s bringing more business to the Mall. I’ve never seen a super market at a mall, but this was a good move for the Westgate Mall area. Everyone seems to be curious about empty space that was Jordan Marsh and then Macy’s. When the Westgate Mall was opened in 1963, the original occupant of that space was a store called Gilchrist’s. I remember it (boy, does that make me feel old). Gilchrist’s closed in 1975. The space was empty for a couple of years until Jordan Marsh opened a store there in 1977. I believe it was the smallest of all the Jordan Marsh locations. I remember that there were times I went there to get something in the sales flyer, only to find out that they didn’t carry my item at that store. In 1996 this store became Macy’s (along with every other Jordan Marsh). In 2006, Macy’s acquired Filenes. 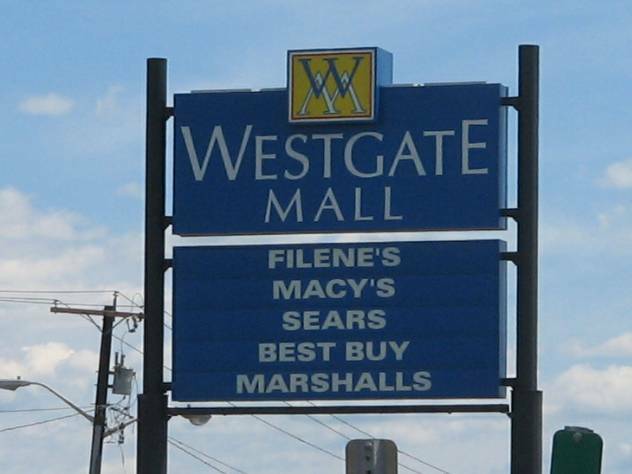 Westgate Mall had a Filenes at the opposite end of the Mall (in a location formerly occupied by Bradlees). As with many other Malls that had both a Macy’s and Filenes, there couldn’t be two Macy’s, so a decision had to be made about which location to keep and which one to close. This was a no-brainer at this particular Mall, because the Filenes location was much larger and nicer. 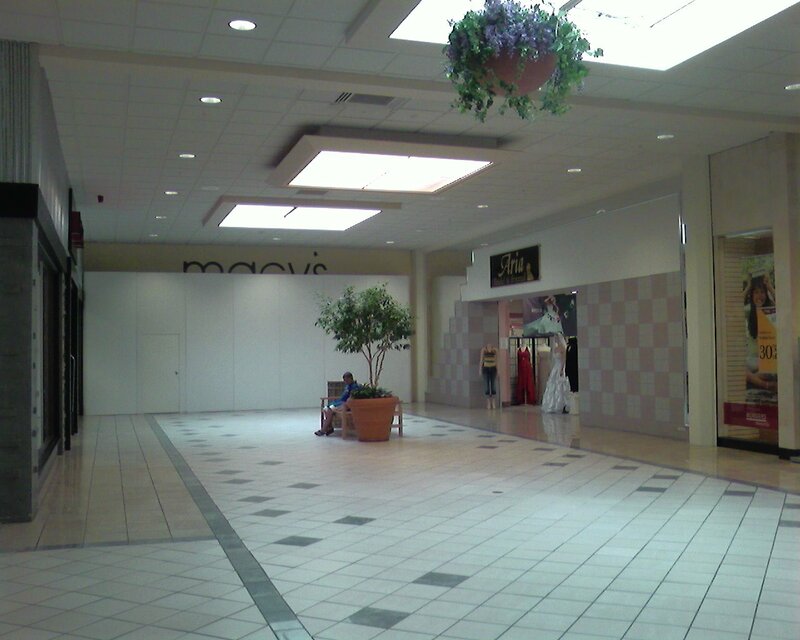 So in 2006, Filenes became Macy’s and the old Macy’s location became vacant. It has been vacant ever since, but it is soon going to be turned into a 12-screen cinema. I used to work at the Woolworth’s in the Westgate Mall back in ’95,in the cafeteria section.Soda dispensers with no refrigeration.It needed ice in the top of it.The menu was old school cafeteria.I worked there for the groovy,old factor. This mall use to be somewhat of a cemetary. It is doing very well now. It is awesome that they’re getting a new movie theater since the old one closed a few years ago. The vacant building that once had Gilchrist, Jordan Marsh and Macy’s is now been demolished. The building is no longer there. Its sad to see that the only last piece of that original building from 1963 is finally gone. They demolished that building on September 29th. It would be intersting to see what the new Cineplex will look like and bring more life back to the mall than it used to be in the 1970’s and 80’s. I hear they are going to be adding more stores outside in the parking lot area near A.C. Moore, but theyre going to need more parking spaces for a 12 screen cinema, so maybe they will add a parking garage , but i dont see that in the plans. Hi. Wondering if the new snazzy renovation of the mall, mostly on the South side of the mall will also include, finally, an upgrade and unified facade on the adjoining West side of the mall??? I was born in Brockton in 1963 so also know much of the mall’s history. At best it’s never been more than quaint and at times run down. Moved to CA in mid-90s but still get back to Brockton at Xmas for family visits. Over that time it’s been interesting to see the mall’s various redevelopment attempts. The first one in the 80s was superficial. The last one in the late 90s was better, especially on the East and North sides of the mall where much of the renovations and additions took place. But they failed to tie together the facade on the West side of the mall as the pics show — like that cheap generic “MALL” sign. Looks like it’s handmade, like a cutout! I grew up in Brockton in the 1950’s and 60’s not far from Westgate Mall. I used to walk there from my home quite often. The Jordan Marsh store at the mall was originally a relatively small Gilchrist’s department store when the mall first opened in 1963. The Gilchrist’s used to be located on Legion Parkway in downtown Brockton, but moved to Westgate when the mall opened. Due to economic conditions, the 12-screen cinema has been put on hold. The cineplex has been scrapped. Its not going to be built after all. @ar, it was outside Woolworths , between there and where Macy’s is now (formerly occupied by Bradlees) before the renovation. Anyone remember Mar’s Discount Store in Brockton? It was a flash in the pan as far as longevity goes, and for the life of me I can’t remember where it was located. 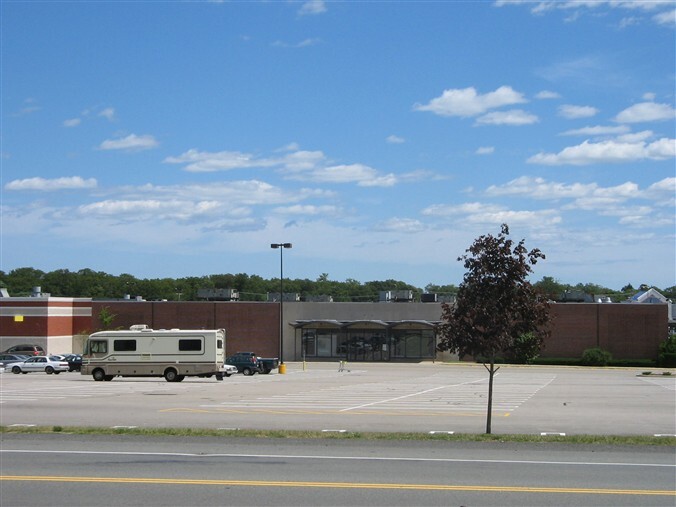 I think it was either on the West Bridgewater line where K-Mart was or may still be, or, on the East Side, later occupied by Caldor, near the Maple Bowling Alleys across the street from Shaw’s (formerly BPM). I Grew up in Brockton in the 60’s – can you tell? There was a lot of hoopla when that Mar’s Discount Store opened, ads on the radio, in the Brockton Enterprise, etc. I’ll never forget a new acquaintance asking me if , “I’d been to Mars yet?” Att first I didn’t make the connection … errrr. no, can’t say that I have, lady. There was An Enormous Kennedy’s in this mall from the beginning of time…. It was very dated, and never renovated, the rent was pennies a square foot, which is the only reason the location stayed afloat. Prior to being Woolworths, it was Gilchrist, my Grandmother was a seamstress that did alterations. It had the luncheonette. I remember visiting her and being in the backroom and then we would have lunch at the luncheonette. When I got older, I loved the Jordan Marsh. It was clean and well run. I hated when they made it Macy’s – it became too cluttered, overpriced and lower quality clothing. That was the downfall of the mall. The flagship became the Jordan Marsh and when the Macy’s came in the entire Mall suffered. There was no reason to go that Mall. We started going to Filene’s at South Shore Plaza.